Lawrence J. Corcoran (August 10, 1859 – October 14, 1891) was an American pitcher in Major League Baseball. He was born in Brooklyn, New York. 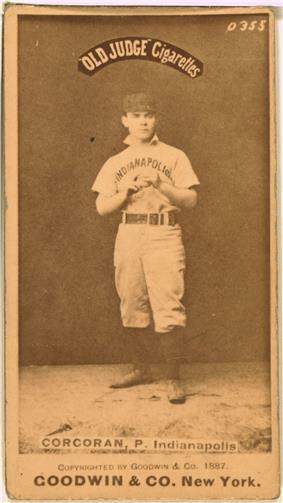 Corcoran debuted in 1880, winning 43 games and leading the Chicago team to the National League championship. Cap Anson alternated him with pitcher Fred Goldsmith, giving Chicago the first true pitching "rotation" in professional baseball. In 1882, Corcoran became the first pitcher to throw two no-hitters in a career. Two seasons later, he became the first pitcher to throw three no-hitters, setting a record that would stand until 1965, when Sandy Koufax threw his fourth no-hitter. He is also famous for being one of baseball's very few switch-pitchers. A natural righty, Corcoran pitched four innings alternating throwing arms on June 16, 1884, due to the inflammation of his right index finger. He is credited with creating the first method of signaling pitches to his catcher, which consisted of moving a wad of chewing tobacco in his mouth to indicate what pitch would be thrown. Corcoran's arm was dead by 1885, and by 1887 he was out of the league. Corcoran, afflicted with Bright's disease, died in Newark, New Jersey at the age of 32. He was interred in the Holy Sepulchre Cemetery in East Orange. His brother, Mike, pitched in one major league game in 1884. ^ a b c "Larry Corcoran Stats". Baseball-Almanac.com. Retrieved 2006-11-15. ^ a b c Carroll, Bob. "Larry Corcoran". BaseballLibrary.com. Retrieved 2006-11-15. ^ "Mike Corcoran". Baseball-Reference.com. Retrieved 2006-11-15.